Some of the most beautiful locations around the world are home to active or dormant volcanoes. There’s Hawaii, Italy, Iceland, Japan, Alaska – the list can go on and on. 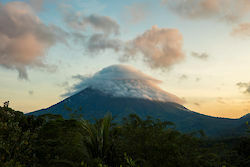 Areas with volcanos often attract tourists looking for amazing views or challenging hiking trails. While this can be exciting and beautiful, traveling near volcanos can often bring risks. How would a volcanic eruption affect your trip? Would travel insurance cover interruptions or cancelations? Our licensed customer care representatives have shed a little light on what to expect if a volcano eruption does interrupt or disrupt your trip. Even if the volcano hasn’t erupted yet, but a possible eruption is imminent, many insurance providers will treat a future eruption as a “foreseen” event and will not cover its impact. However, not all companies will make the decision that quickly – they may wait for an actual eruption. Also, you may still be eligible for cancel for any reason coverage, depending on when you booked your trip. The specialists at InsureMyTrip can direct you to the right plan from our companies. If you already have a plan purchased when a volcano starts acting up, contact us directly and ask a representative about how your travel insurance policy will cover you for volcano-related issues. We can’t pre-determine claims, but we can help to explain wording in the plan certificate related to cancellation, interruption and travel delay benefits. It’s best to know the extent of your coverage before any travel disruption. In 2010, travel disruptions related to the drifting Icelandic volcanic ash were treated as weather-related trip cancellations for those who had not started their trip and as weather-related trip interruptions for those who were stranded. Volcano-related claims totaled millions of dollars after the eruptions of Eyjafjallajökull. Travel insurance companies may react differently as volcano activity occurs; there is no set standard in the industry as each situation is different. Companies will typically reimburse nonrefundable, prepaid travel expenses (like hotel, tour, cruise or airfare charges) up to the amount you insured. Some policies can also help with the additional travel costs of getting you back home again, up to 50 percent of the original trip cost. Also, for those stranded, travel delay benefits may be available to reimburse your costs for hotel and food that you may incur while delayed. Note: Each policy will have a maximum amount available for reimbursement. If you are stuck due to an ash cloud, call the 24/7 emergency assistance phone line found on your travel insurance policy. Representatives at the assistance company can often help you book a trip home, or find you a place to stay overnight. With a policy offering Cancel For Any Reason benefits, you will be able to cancel your trip for any volcano-related reason, regardless of the covered cancellation reasons listed on your plan. This is a time-sensitive benefit on some plans, typically only available 10-30 days after making the first payment towards your trip. Also, there are other requirements that must be met (For example, you must cancel 48 or more hours before departure, and you must insure 100% of trip costs). Finally, you are only going to receive a percentage of your investment back – typically 75%.